Sash and Saber - a specific SYW range. Trident - an AWI range with a good Hessian contingent that serves for Prussians. 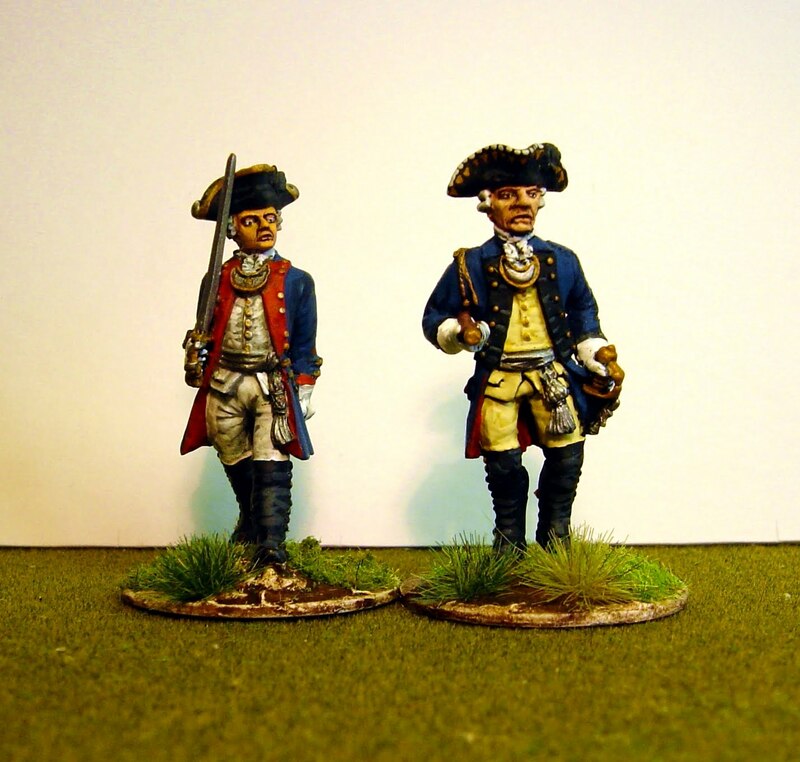 Front Rank - an AWI range with Hessians/Prussians as well. The gentleman on the left is a Front Rank figure painted as Generalmajor Karl Ferdinand von Hagen, who was killed at Hochkirch. Although he looks a bit young, this is a well sculpted figure that comes with a separate right arm and a choice of 3 separate heads. The figure on the right (whom you have seen before) is from Trident and represents Generalmajor Emanuel von Schoning, who was killed at the battle of Prague. Both figures are wearing regimental uniform, in the case of the former IR8 and in the case of the latter, IR46. Size-wise they sit well side by side. The Front Rank figure has led an epicurean existance, as have all figures from this manufacturer, which would account for his ample stomach whereas the chap from Trident has a somewhat lean and hungry look. very nice Nigel , very nice indeed..now back to getting that Russian uniform book done please! Irregular Miniatures - 'LWAW 37 Mounted general waving hat'. is useable. I have also cast up some mounted officers using a Creartec 40mm mould as well. 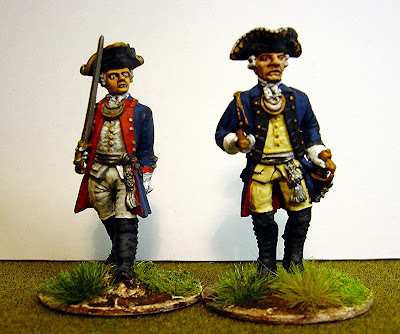 They are great and so well painted, as usual - thanks for sharing! I follow with pleasure your 40mm tasks - it´s also my prefered scale. I will wait for your new posts with inpatience! Beautifully painted, Nigel. I like the way the head is inclined on the Front Rank sculpt.